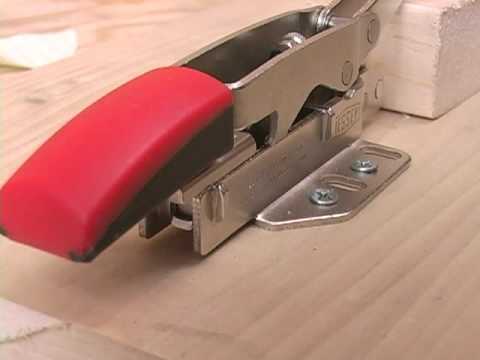 Toggle clamps are the go to clamps when it comes to jigs and fixtures for hobby woodworking and even large scale manufacturing. Their ability to secure your workpiece in just a matter of seconds is what makes them ideal for many clamping needs. However, toggle clamps do have a downside, they do require a bit of setup time to get the clamps adjusted to the size of material you are clamping. If you need to change from one size of material to another, you are better off just build a jig for each size. All of adjustments downsides of toggle clamps are no more thanks to the new self-adjusting toggle clamps from Bessey Tools. The new clamp uses technology similar to my favorite self-adjusting LockJaw Clamps and has me thinking that Bessey is actually licensing the auto-adjusting tech. 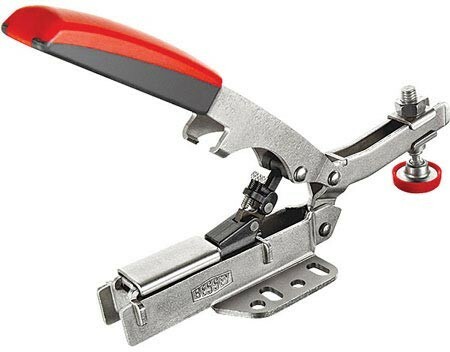 The Bessy Auto-Adjust Clamps come in three different types; they have both high and low horizontal clamps that allow for different material thicknesses, as well as a vertical clamp. All three clamps have adjustable clamping pressure of 25 to 550 pounds that is easily configured via a thumb screw. The three clamps run about $20 each and cost only a few dollars more then similarly weight rated non self-adjusting clamps. The slight added cost really seems like a bargain to me for the speed gained.